Oil of oregano standardised 70% carvacrol, with broad-spectrum, anti-infection properties. 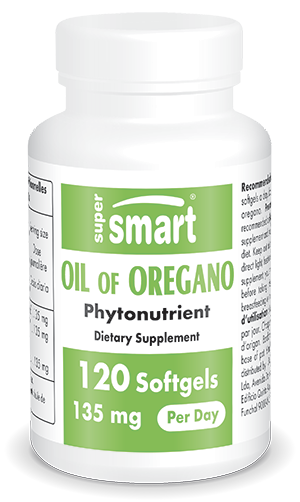 Oil of oregano is extracted from oregano (Origanum vulgare), an aromatic, Mediterranean plant traditionally used to boost digestive, respiratory and joint function. One tonne of oregano is needed to produce 15-30 litres of oil. At the height of Islamic civilization, it was already being used by doctors to treat infectious diseases. - oil of oregano eliminates human coronavirus and prevents replication in virus-infected host cells. Each capsule contains 45 mg oil of oregano standardised to provide 70% carvacrol, a phenolic compound known for its broad-spectrum anti-infection properties. Ingredients: soy lecithin, min. 62% phospholipids, oil of oregano. Take one to three capsules a day or as advised by your therapist.